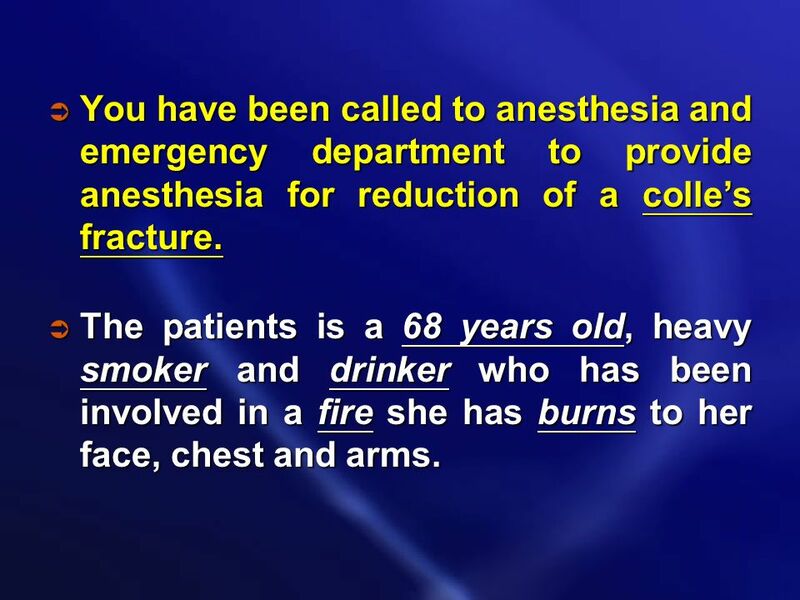 2 You have been called to anesthesia and emergency department to provide anesthesia for reduction of a colle’s fracture. The patients is a 68 years old, heavy smoker and drinker who has been involved in a fire she has burns to her face, chest and arms. 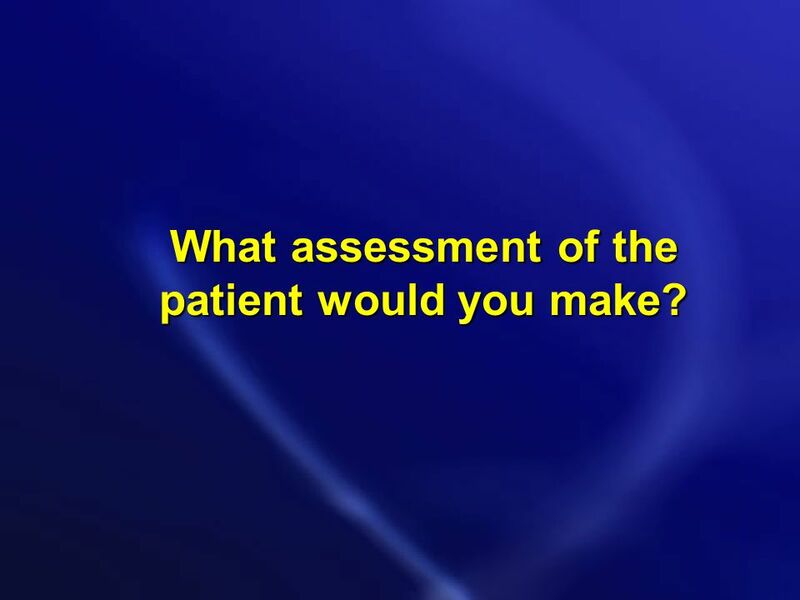 3 Questions What assessment of the patients would you make? 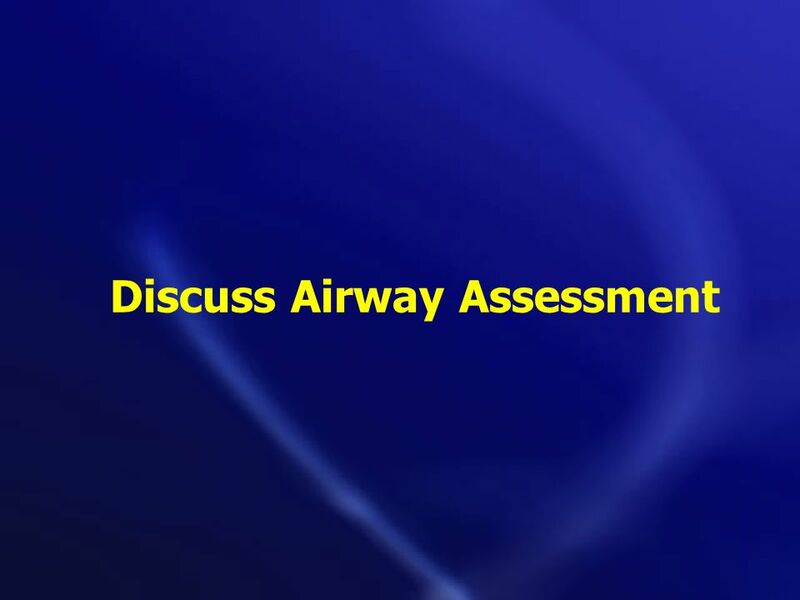 Discuss airway assessment, The significance of perform SaO2 and other investigations you would perform (COHb). 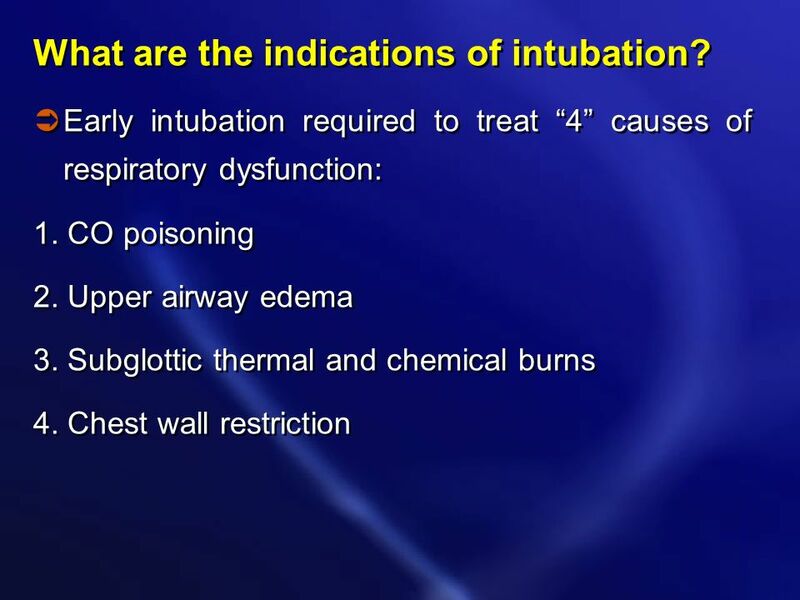 What are the indications for intubations. 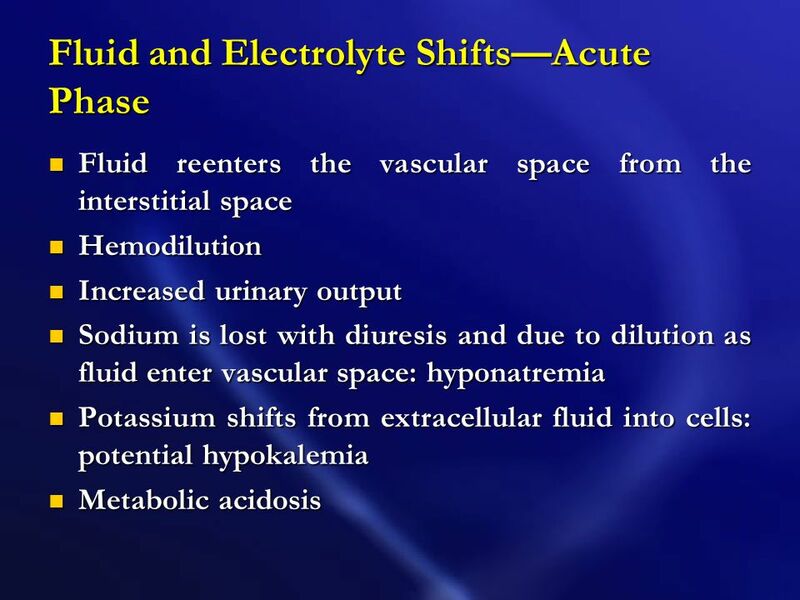 What fluid requirements will patients have ? 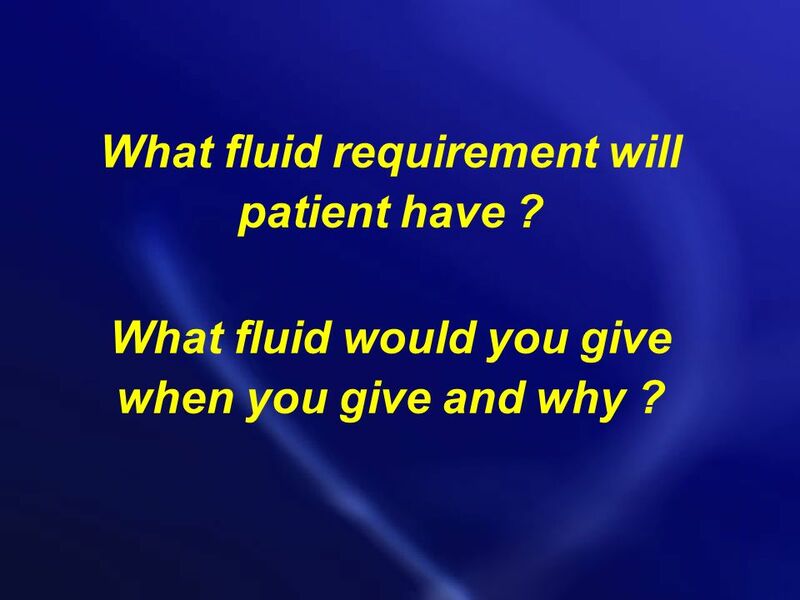 What fluid would you give, when you give, and why ? Discuss analgesia, are burns painful ? Would you give an anesthetic for the fracture ? 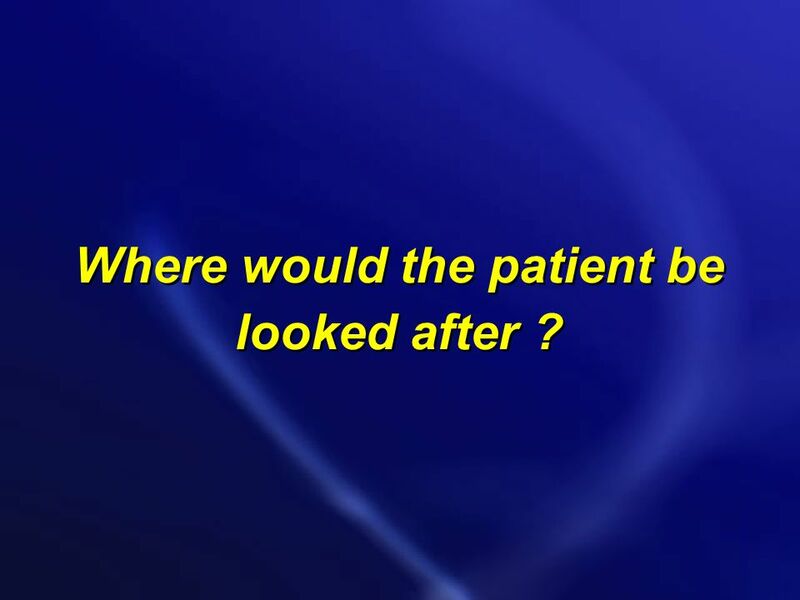 Where should the patient be looked after ? 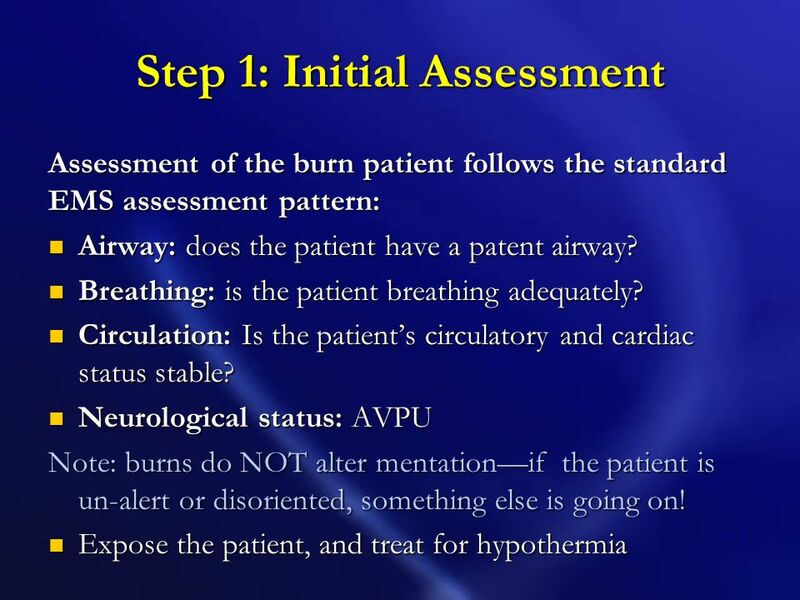 4 What assessment of the patient would you make? How did the burn occur? Did the patient’s clothing ignite? Were accelerants involved? Was patient found in smoke-filled room? Did the patient leap from a window, fall, or roll a vehicle? 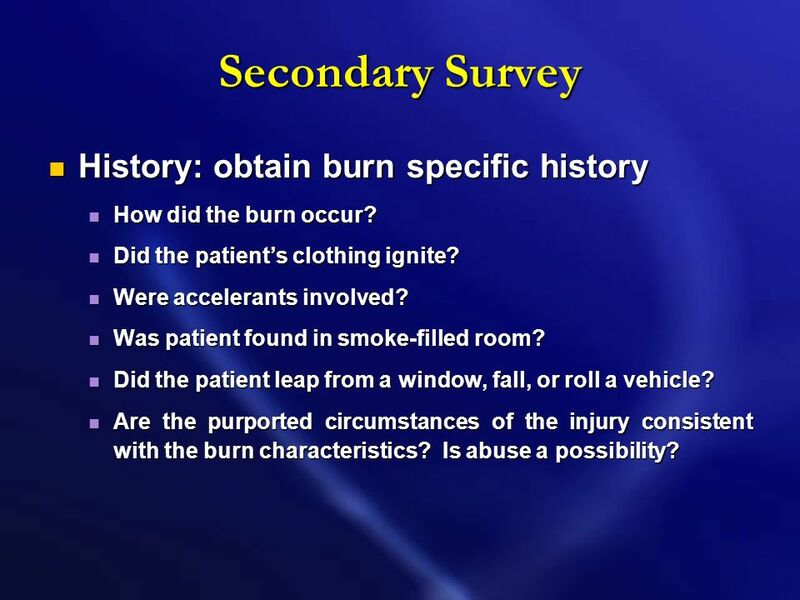 Are the purported circumstances of the injury consistent with the burn characteristics? Is abuse a possibility? 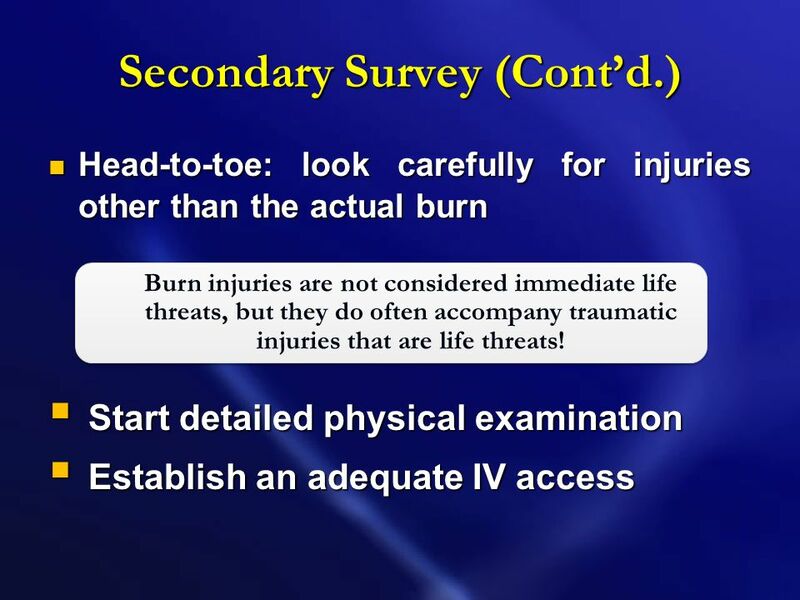 Head-to-toe: look carefully for injuries other than the actual burn Start detailed physical examination Establish an adequate IV access Burn injuries are not considered immediate life threats, but they do often accompany traumatic injuries that are life threats! 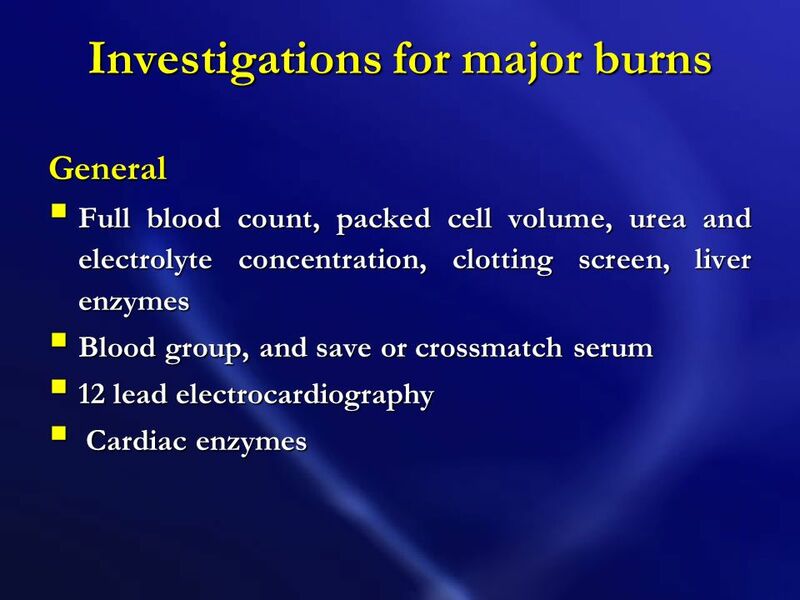 First degree burns (epidermal burns) are red, appear DRY, blanch when pressed upon, and blister mildly. 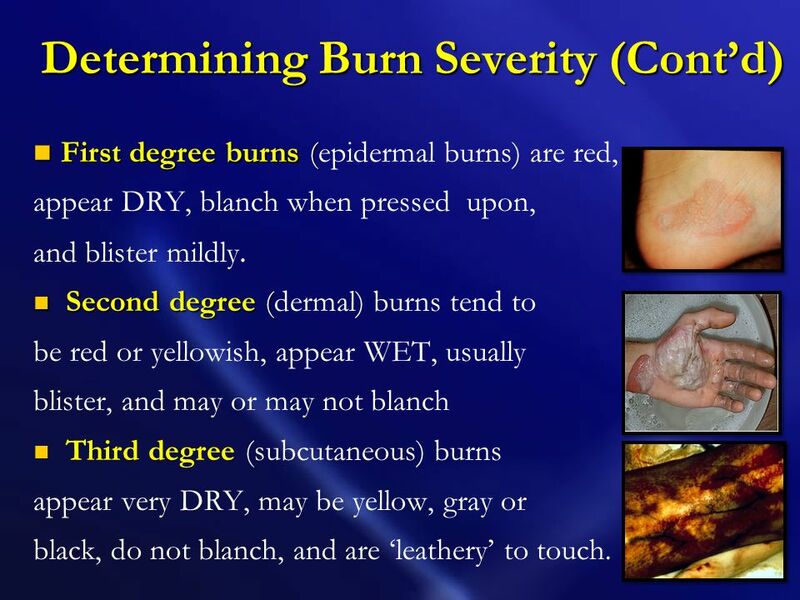 Second degree (dermal) burns tend to be red or yellowish, appear WET, usually blister, and may or may not blanch Third degree (subcutaneous) burns appear very DRY, may be yellow, gray or black, do not blanch, and are ‘leathery’ to touch. 11 Patient is: 68 yrs old. Fire – burns to face, chest and arms. Colle’s fracture. Heavy smoker. Drinker. 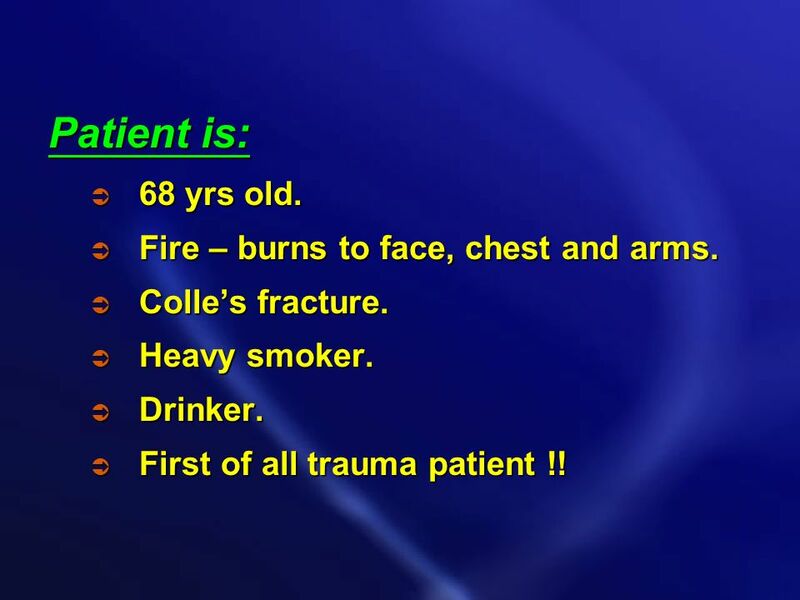 First of all trauma patient !! Unable to escape fire due to Extremes of age Immobility due to other trauma Reduction of level of consciousness: alcohol, drugs, effects of smoke. 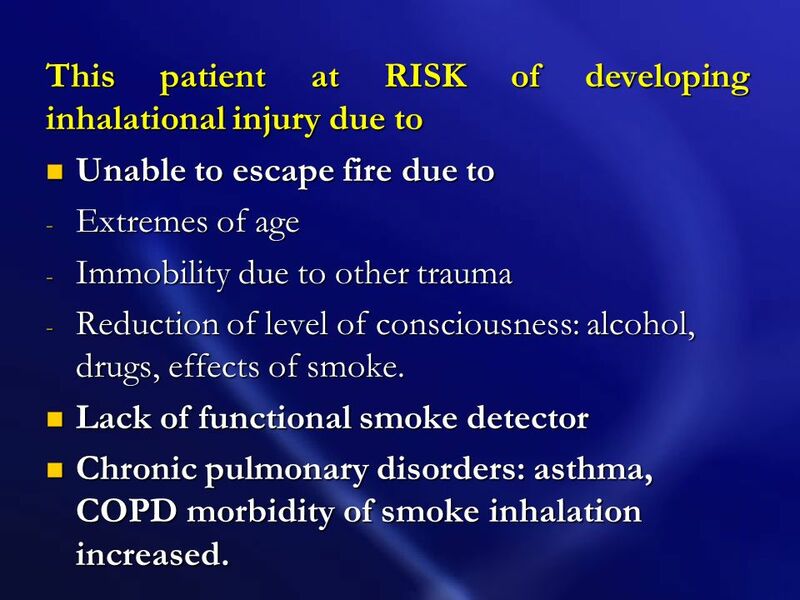 Lack of functional smoke detector Chronic pulmonary disorders: asthma, COPD morbidity of smoke inhalation increased. History - Was the fire in an enclosed space. - Duration of exposure. -What type of material burned, e.g., paints, chemicals. - Level of consciousness on scene. 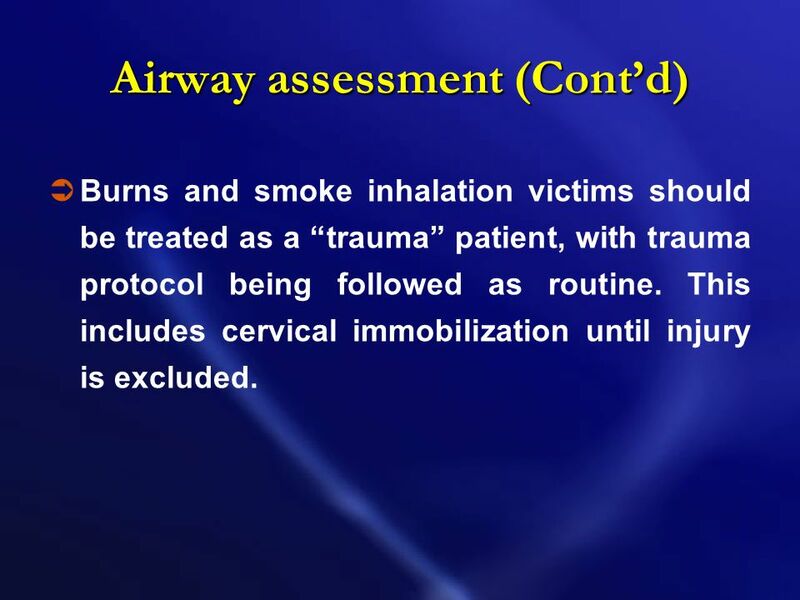 Burns and smoke inhalation victims should be treated as a “trauma” patient, with trauma protocol being followed as routine. This includes cervical immobilization until injury is excluded. 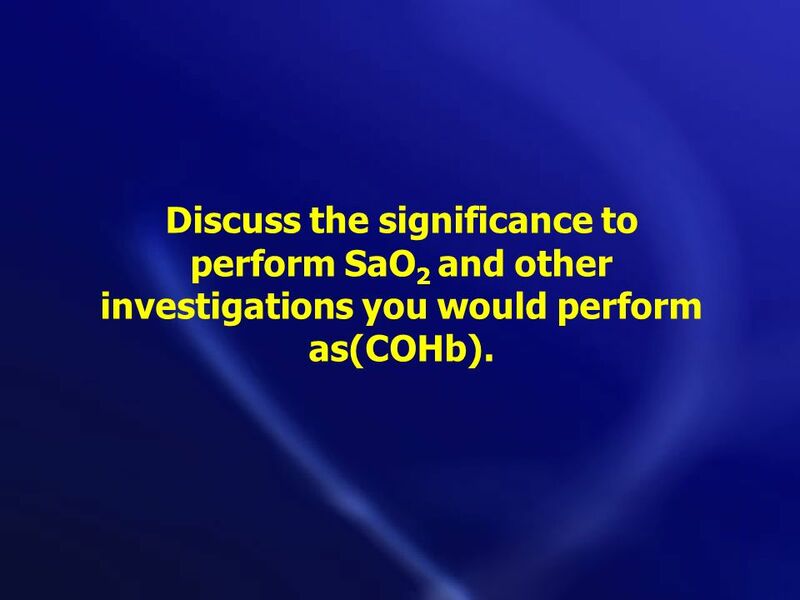 21 Discuss the significance to perform SaO2 and other investigations you would perform as(COHb). 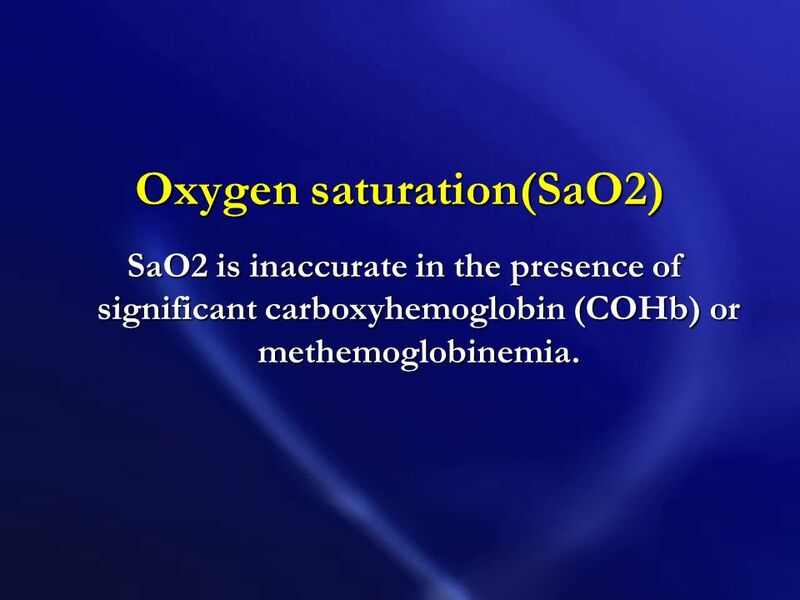 SaO2 is inaccurate in the presence of significant carboxyhemoglobin (COHb) or methemoglobinemia. 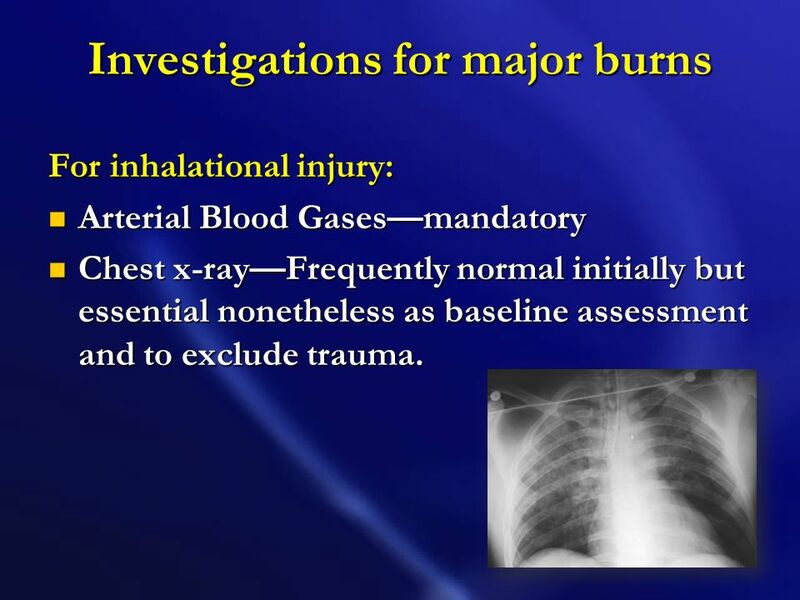 For inhalational injury: Arterial Blood Gases—mandatory Chest x-ray—Frequently normal initially but essential nonetheless as baseline assessment and to exclude trauma. 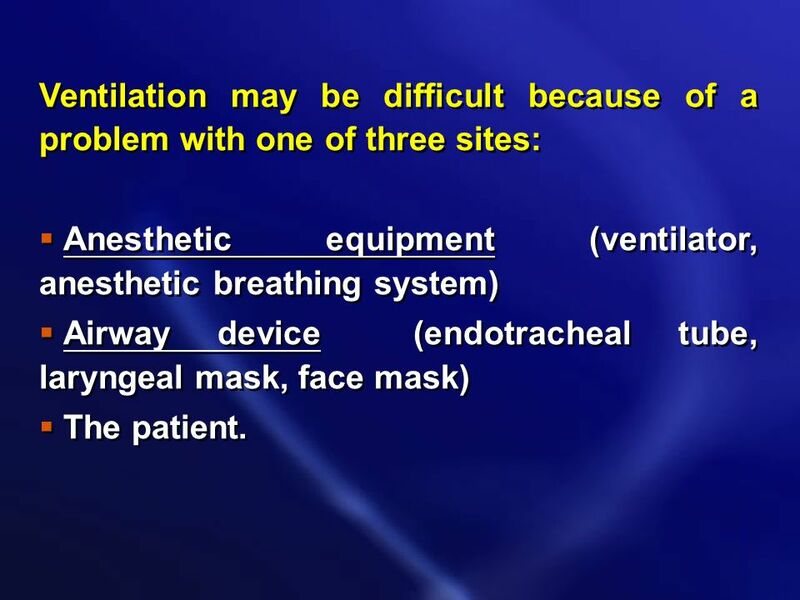 28 What are the indications of intubation? 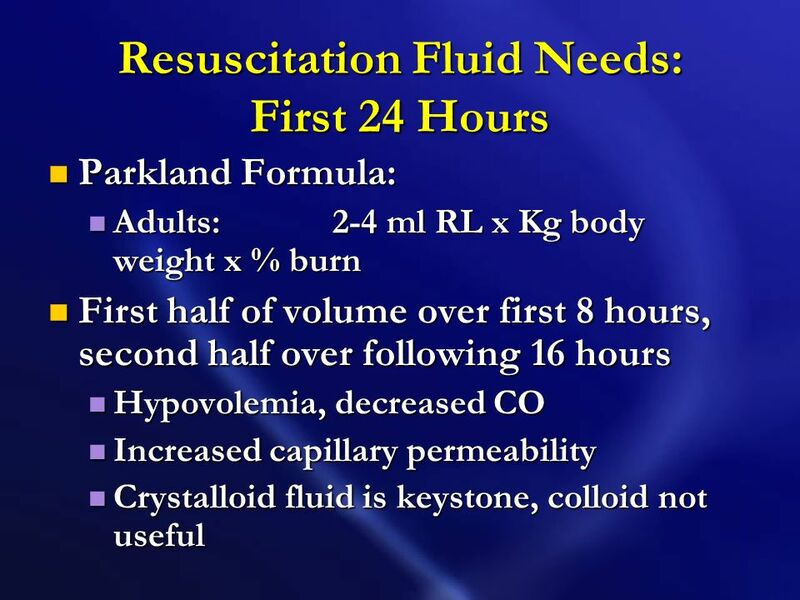 29 What fluid requirement will patient have ? 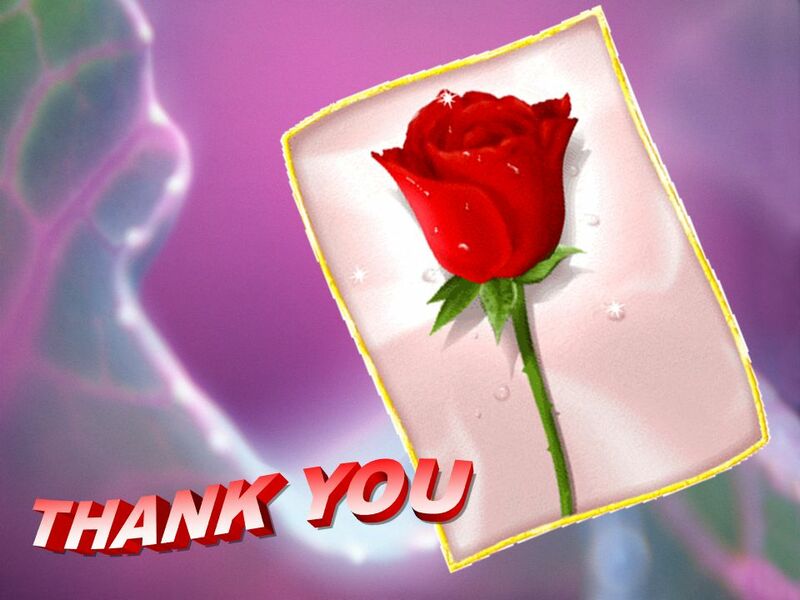 What fluid would you give when you give and why ? 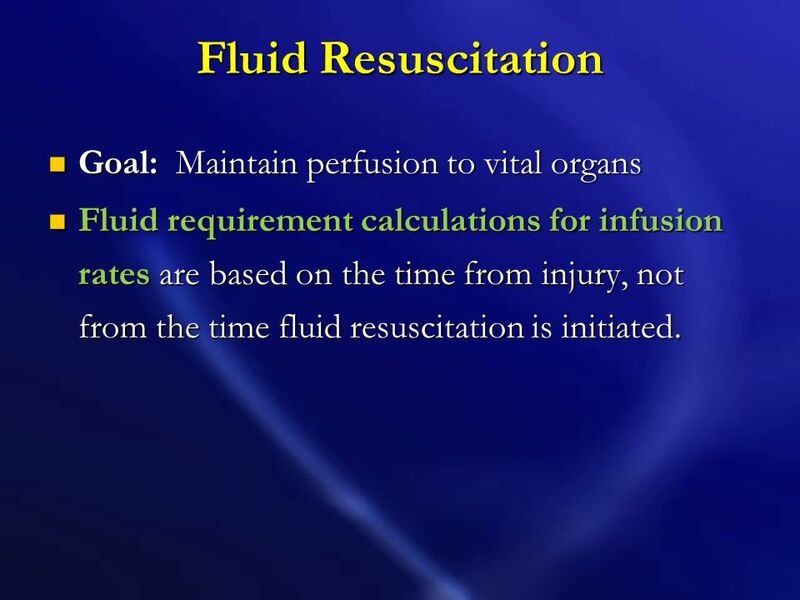 Fluid requirement calculations for infusion rates are based on the time from injury, not from the time fluid resuscitation is initiated. 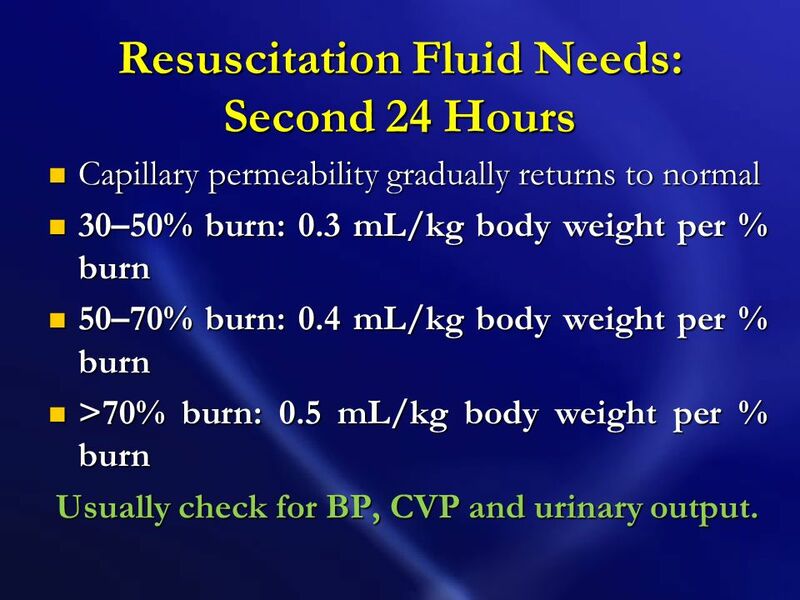 Capillary permeability gradually returns to normal 30–50% burn: 0.3 mL/kg body weight per % burn 50–70% burn: 0.4 mL/kg body weight per % burn >70% burn: 0.5 mL/kg body weight per % burn Usually check for BP, CVP and urinary output. 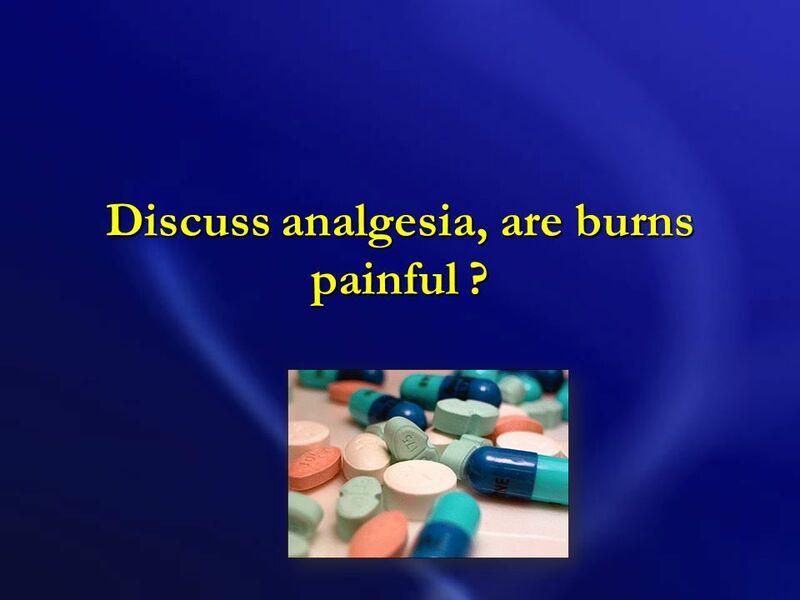 38 Discuss analgesia, are burns painful ? 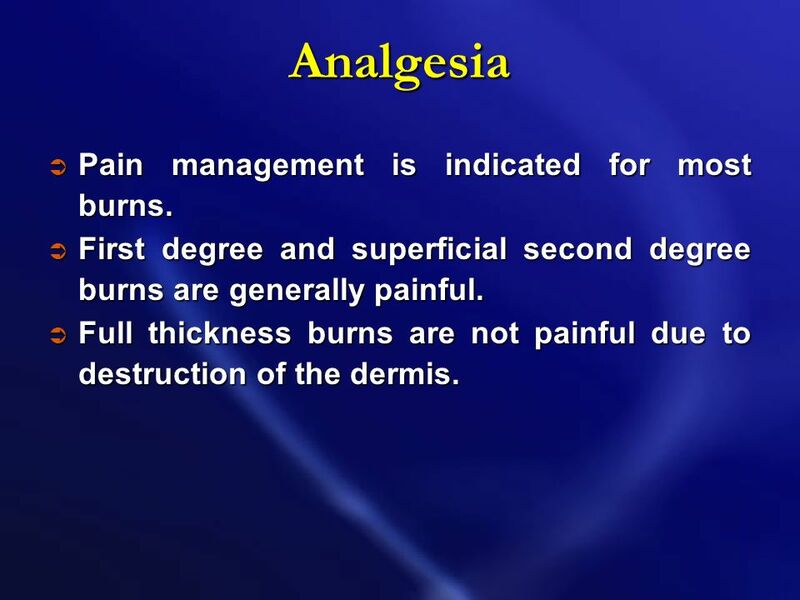 39 Analgesia Pain management is indicated for most burns. First degree and superficial second degree burns are generally painful. 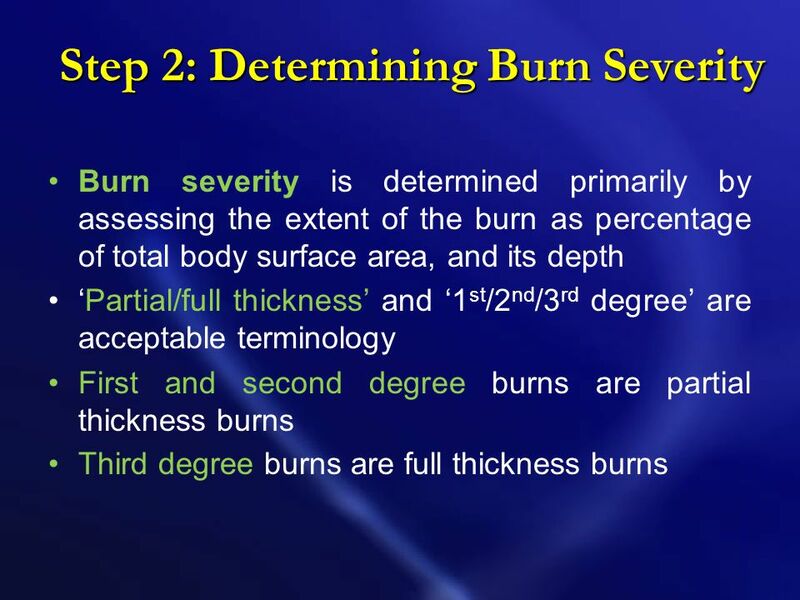 Full thickness burns are not painful due to destruction of the dermis. Analgesia Morphine is the drug of choice for pain Should be titrated intravenously only. Subcutaneous and intramuscular routes become trapped in tissues by edema and can induce respiratory arrest as the edema resolves which may kill the patient. 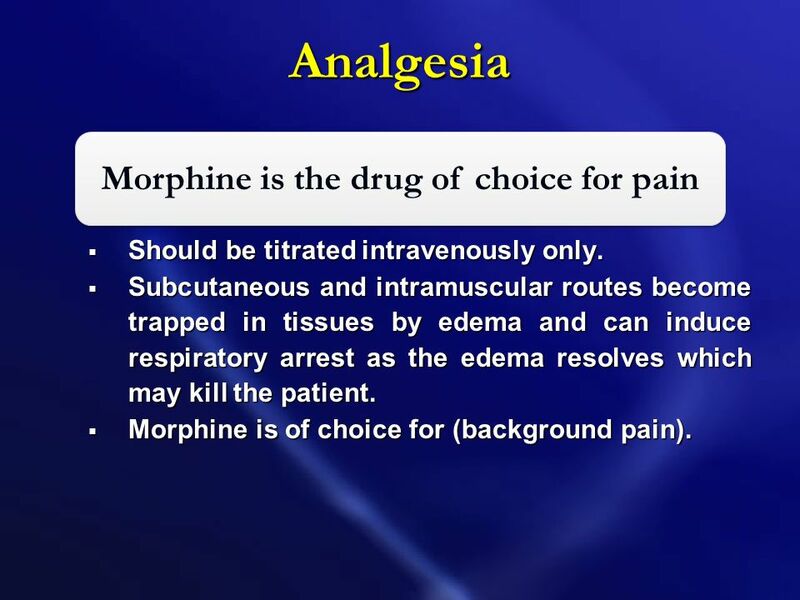 Morphine is of choice for (background pain). 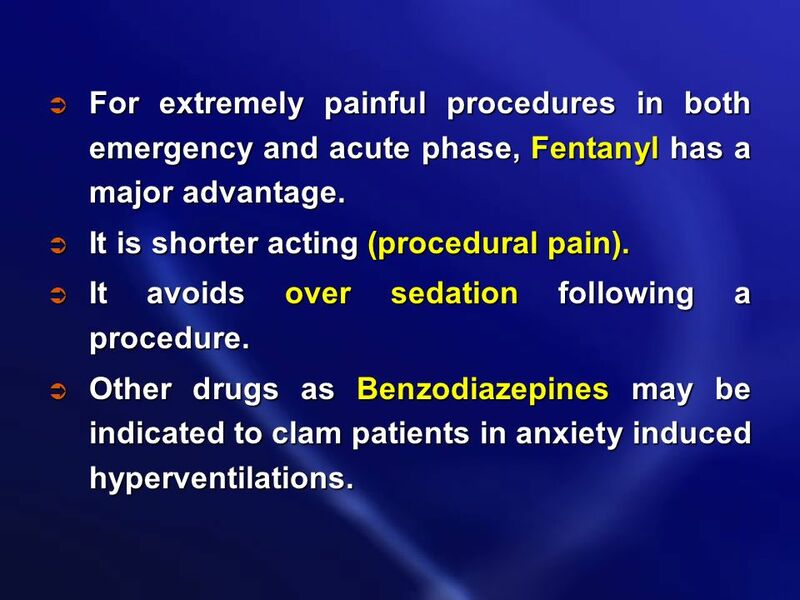 41 For extremely painful procedures in both emergency and acute phase, Fentanyl has a major advantage. 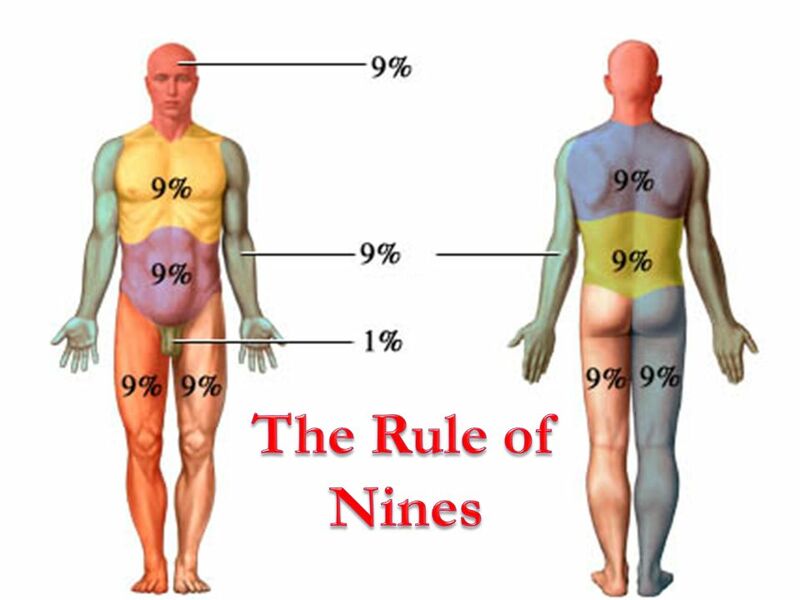 It is shorter acting (procedural pain). It avoids over sedation following a procedure. 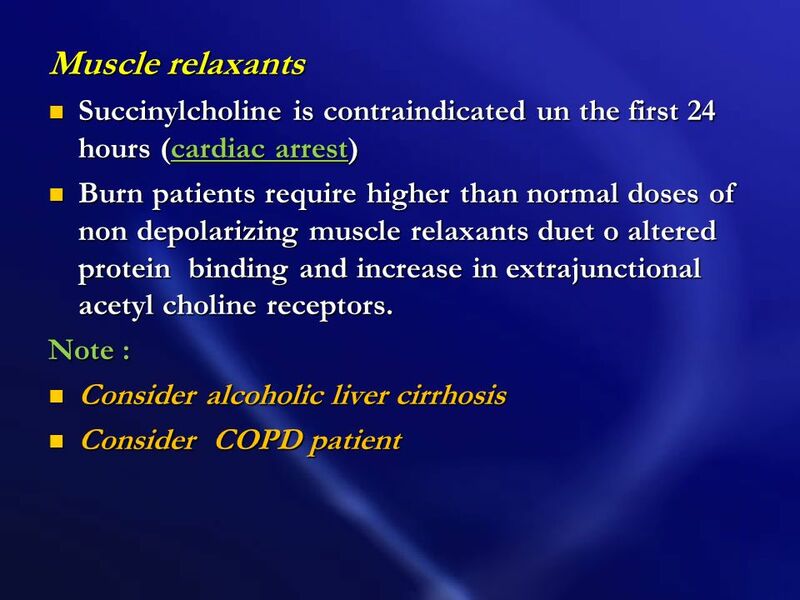 Other drugs as Benzodiazepines may be indicated to clam patients in anxiety induced hyperventilations. 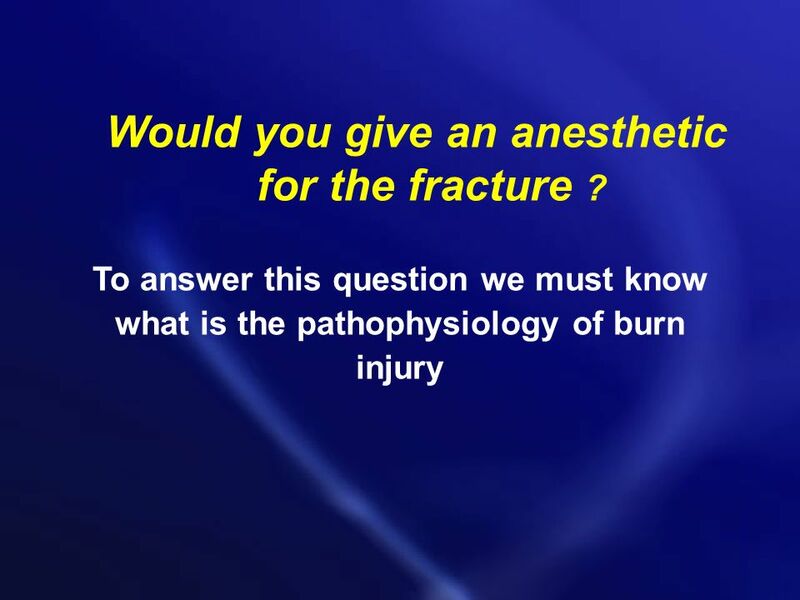 42 Would you give an anesthetic for the fracture ? 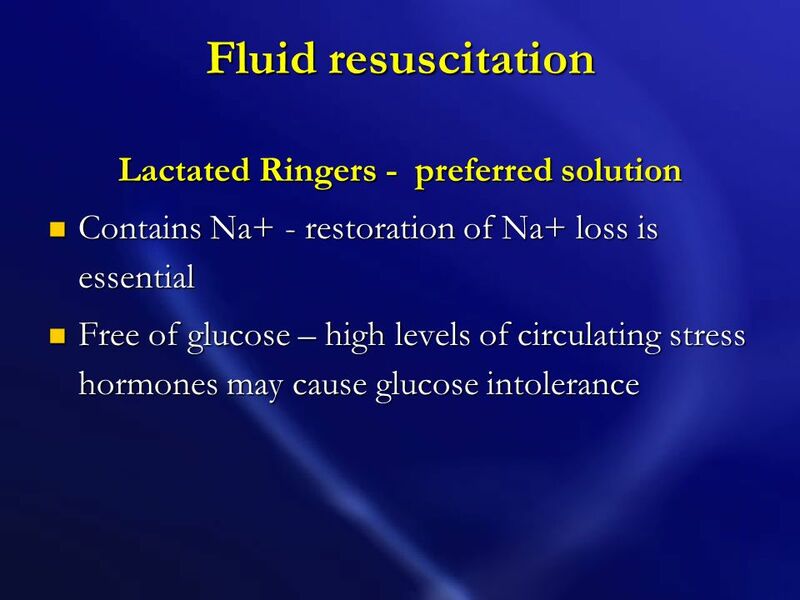 Give anesthesia for patients as soon as hemodynamics are stabilized. 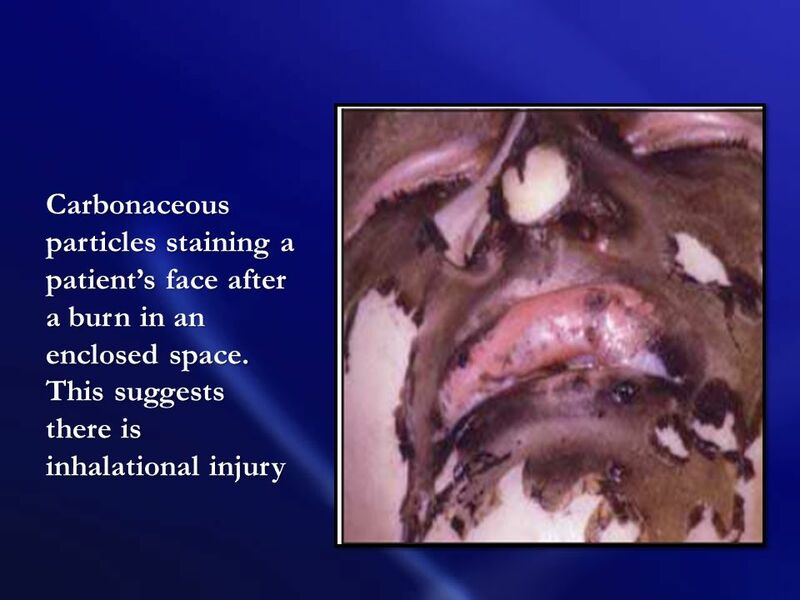 Regional anesthesia can be used effectively in small burns or patients undergoing reconstructive procedures. 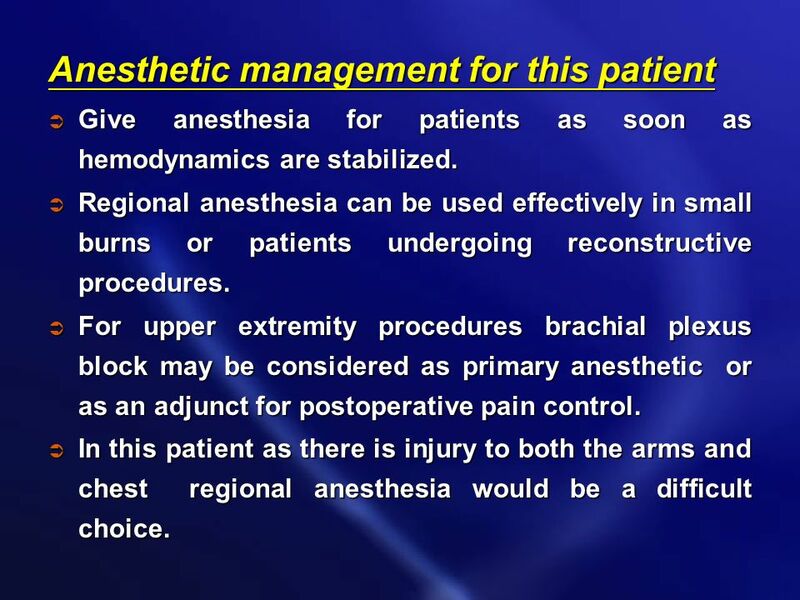 For upper extremity procedures brachial plexus block may be considered as primary anesthetic or as an adjunct for postoperative pain control. In this patient as there is injury to both the arms and chest regional anesthesia would be a difficult choice. 47 Remember also: Casts over burn must be avoided. 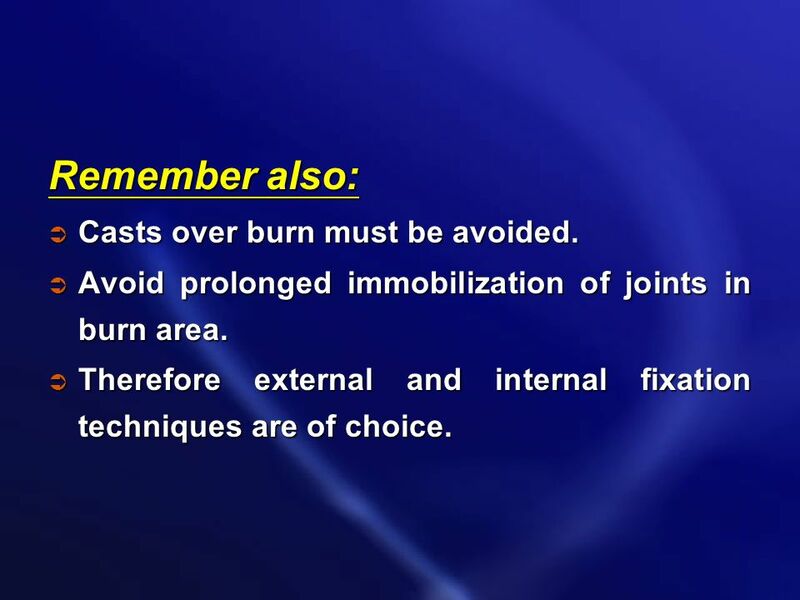 Avoid prolonged immobilization of joints in burn area. Therefore external and internal fixation techniques are of choice. 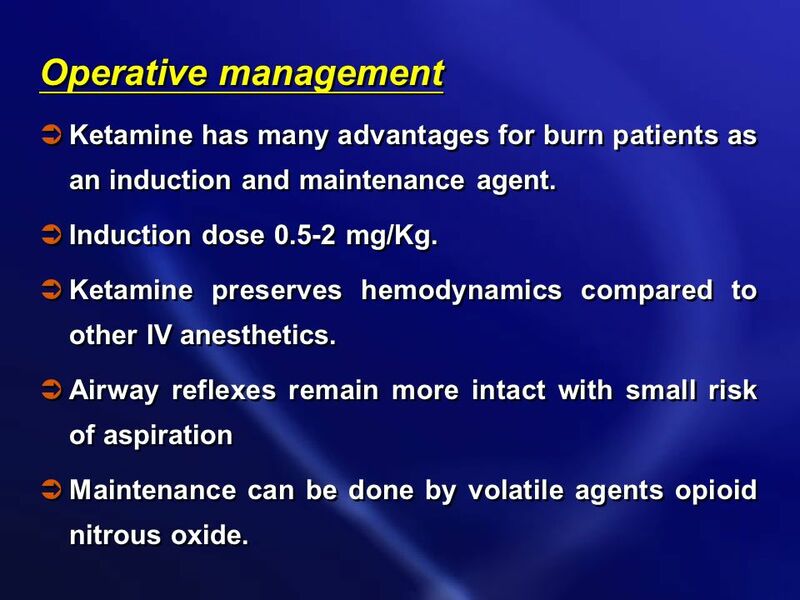 48 Operative management Ketamine has many advantages for burn patients as an induction and maintenance agent. Induction dose mg/Kg. Ketamine preserves hemodynamics compared to other IV anesthetics. Airway reflexes remain more intact with small risk of aspiration Maintenance can be done by volatile agents opioid nitrous oxide. 50 Where would the patient be looked after ? 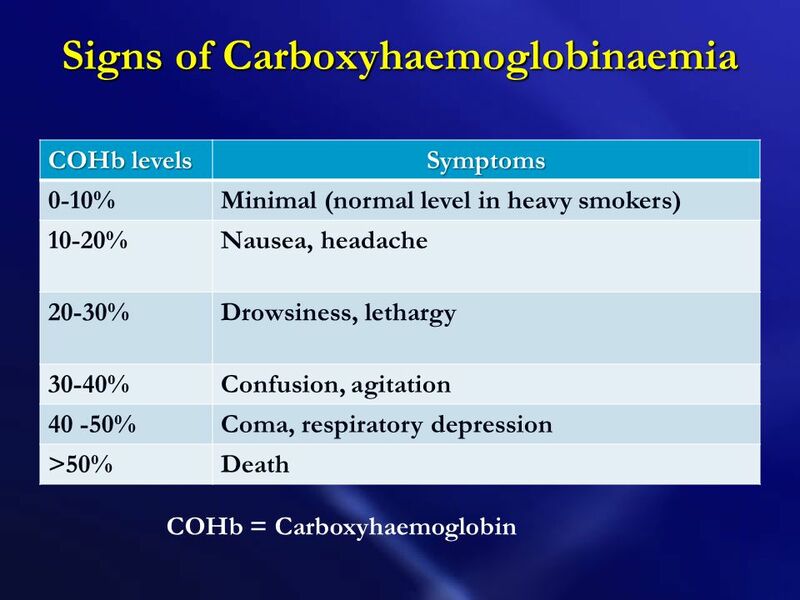 Second and third degree ≥ 20% TBSA. Second and third degree burns that involve face, hands, genitalia perineum and major joints. 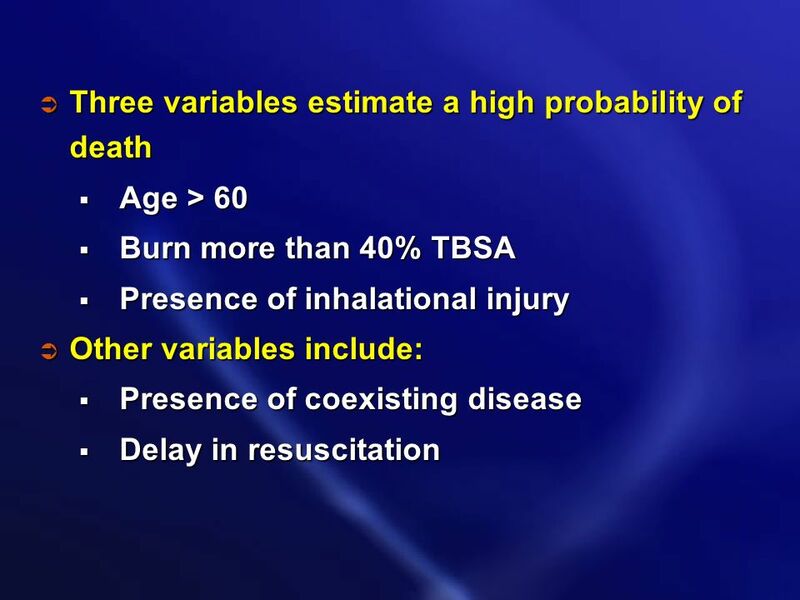 Full thickness burn ≥5% TBSA. 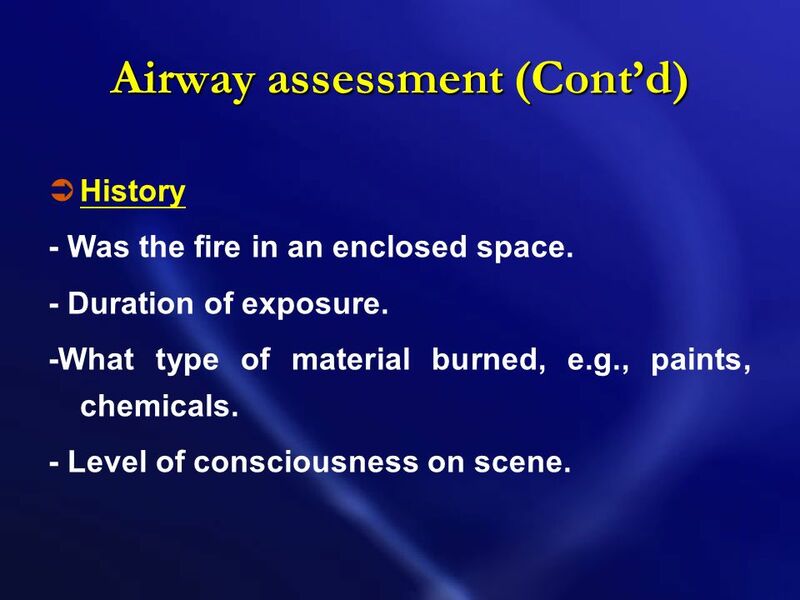 Inhalational injury. 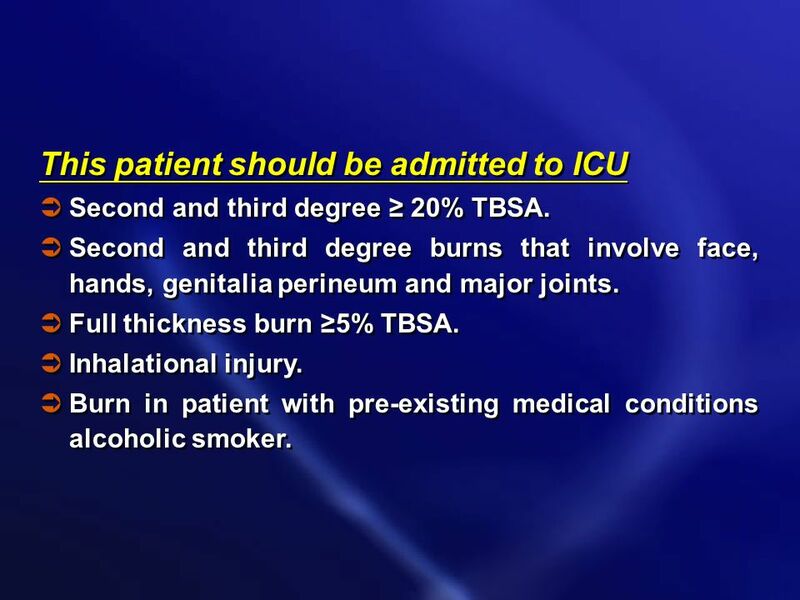 Burn in patient with pre-existing medical conditions alcoholic smoker. 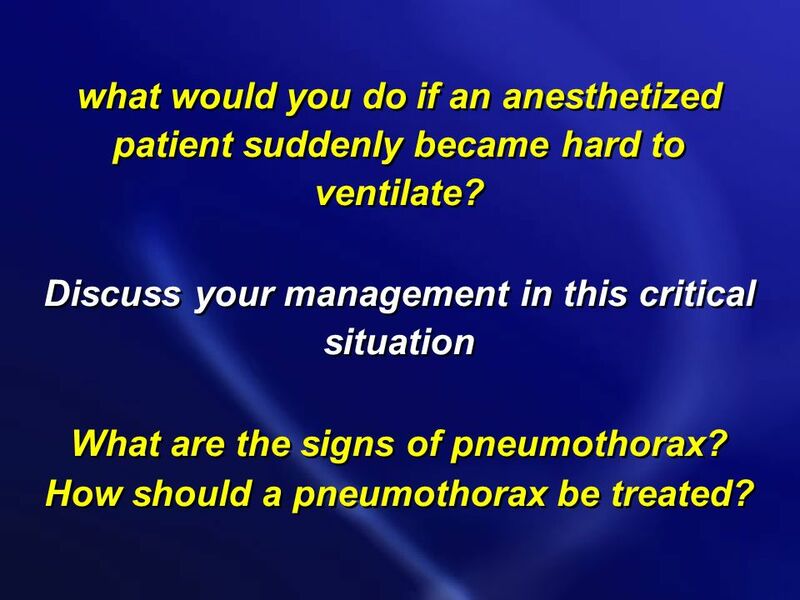 what would you do if an anesthetized patient suddenly became hard to ventilate? 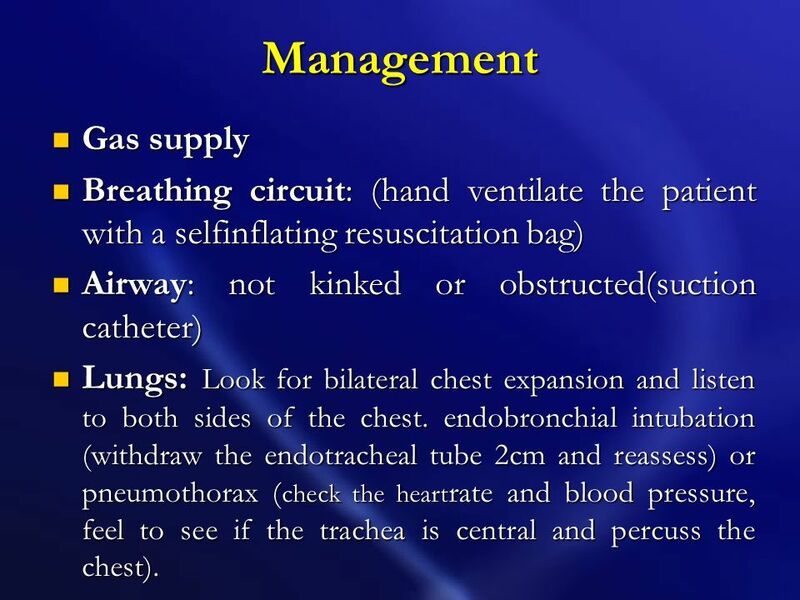 Discuss your management in this critical situation What are the signs of pneumothorax? 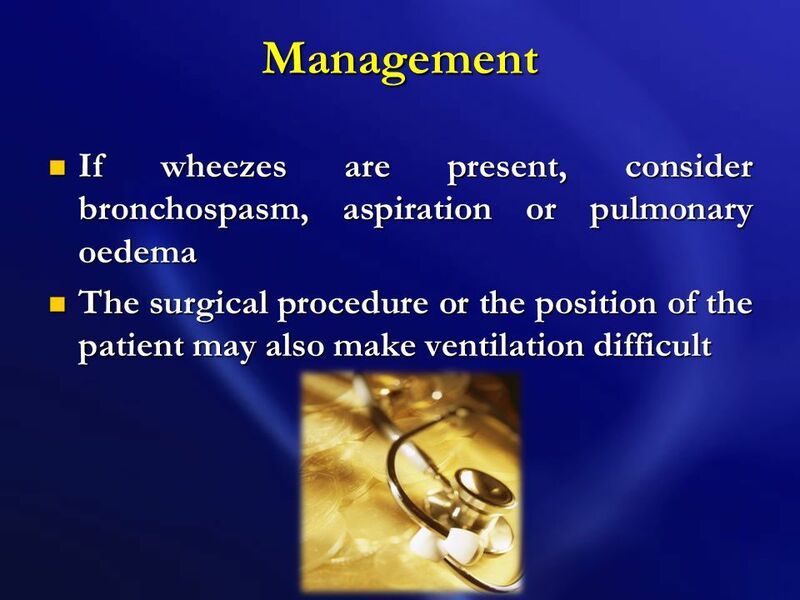 How should a pneumothorax be treated? Anesthetic equipment (ventilator, anesthetic breathing system) Airway device (endotracheal tube, laryngeal mask, face mask) The patient. 55 Management Gas supply Breathing circuit: (hand ventilate the patient with a selfinflating resuscitation bag) Airway: not kinked or obstructed(suction catheter) Lungs: Look for bilateral chest expansion and listen to both sides of the chest. 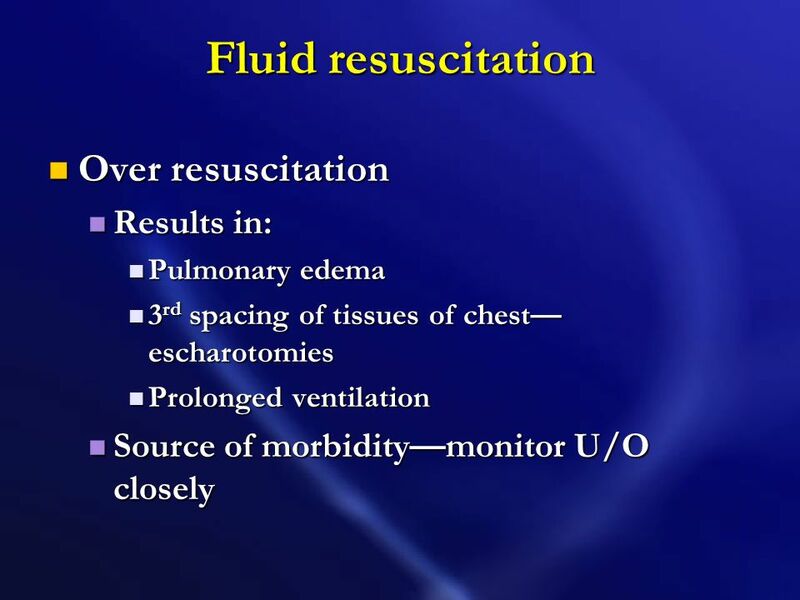 endobronchial intubation (withdraw the endotracheal tube 2cm and reassess) or pneumothorax (check the heartrate and blood pressure, feel to see if the trachea is central and percuss the chest). Insertion of intercostal nerve blocks or Placing a central venous catheter. 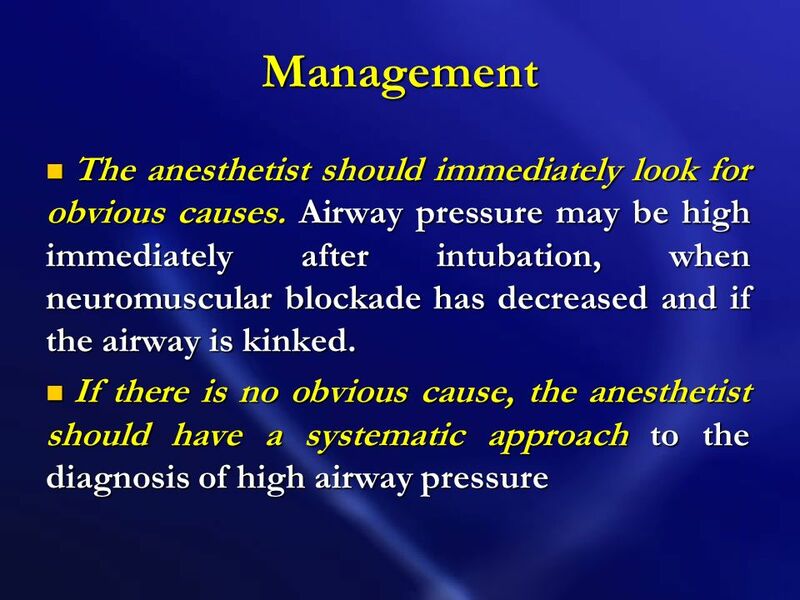 It can happen spontaneously or because of chest trauma or high ventilation pressure during general anesthesia. 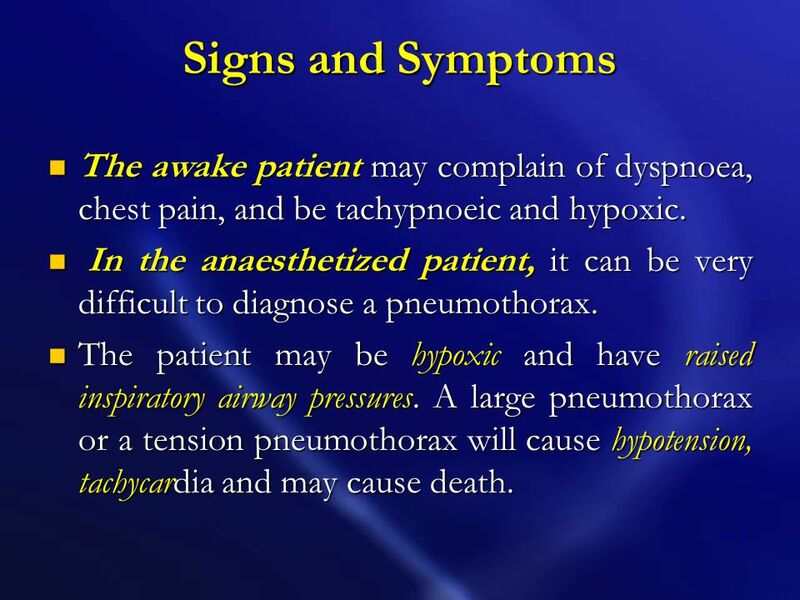 58 Signs and Symptoms The awake patient may complain of dyspnoea, chest pain, and be tachypnoeic and hypoxic. 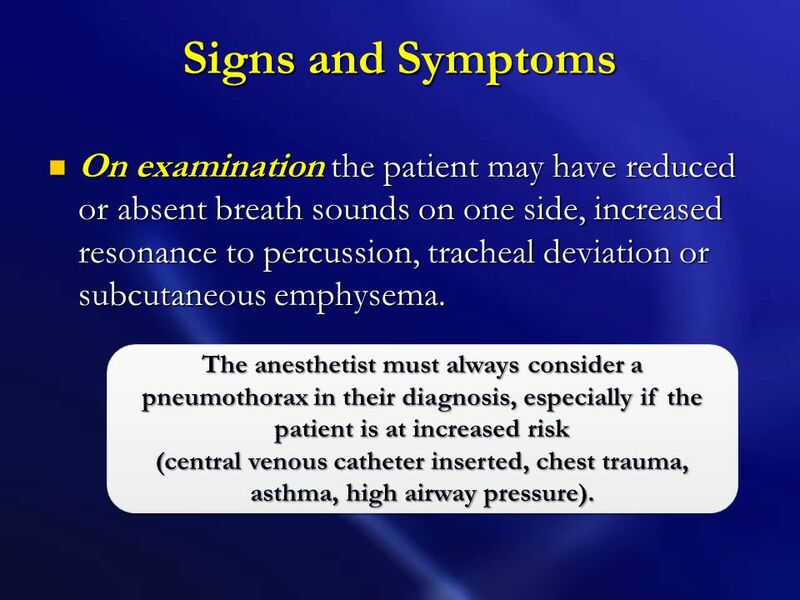 In the anaesthetized patient, it can be very difficult to diagnose a pneumothorax. 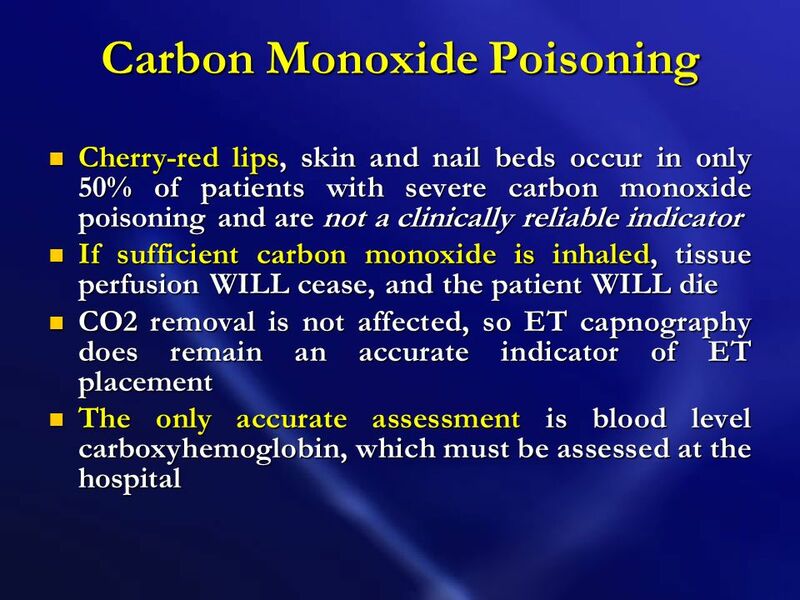 The patient may be hypoxic and have raised inspiratory airway pressures. A large pneumothorax or a tension pneumothorax will cause hypotension, tachycardia and may cause death. 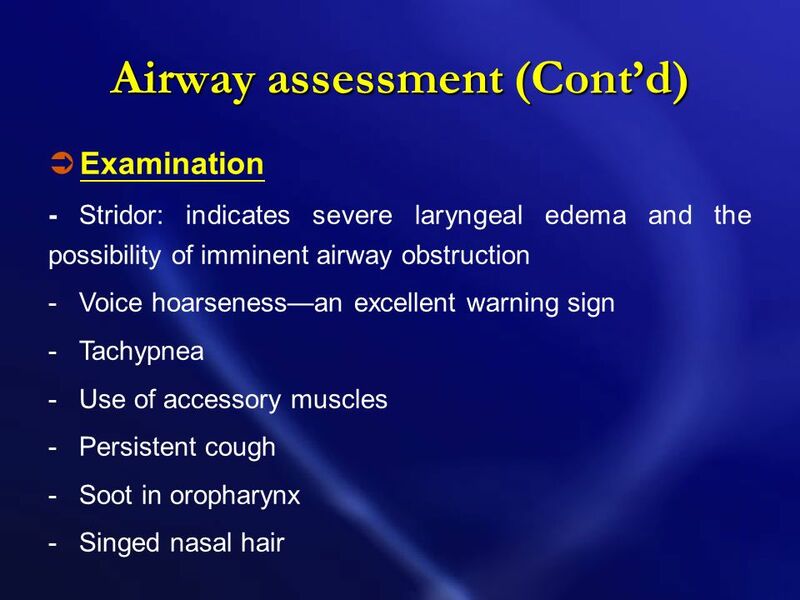 59 Signs and Symptoms On examination the patient may have reduced or absent breath sounds on one side, increased resonance to percussion, tracheal deviation or subcutaneous emphysema. 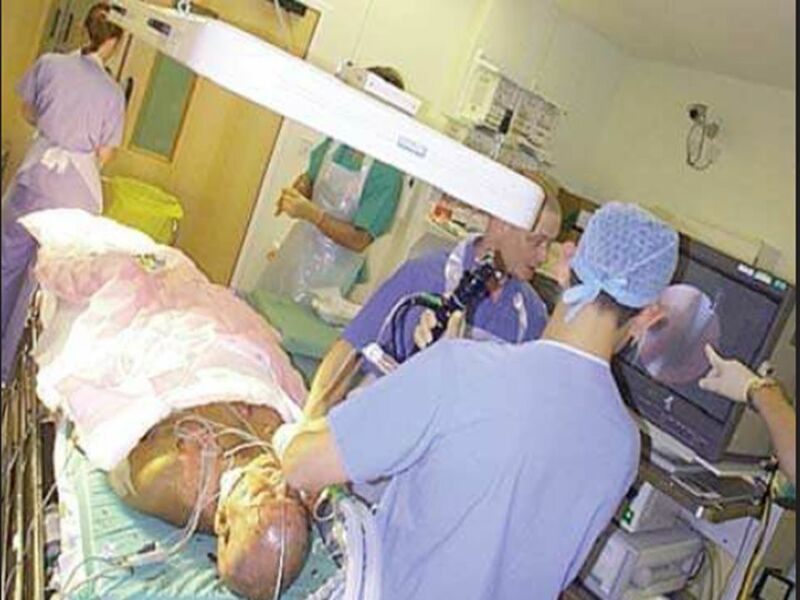 The anesthetist must always consider a pneumothorax in their diagnosis, especially if the patient is at increased risk (central venous catheter inserted, chest trauma, asthma, high airway pressure). 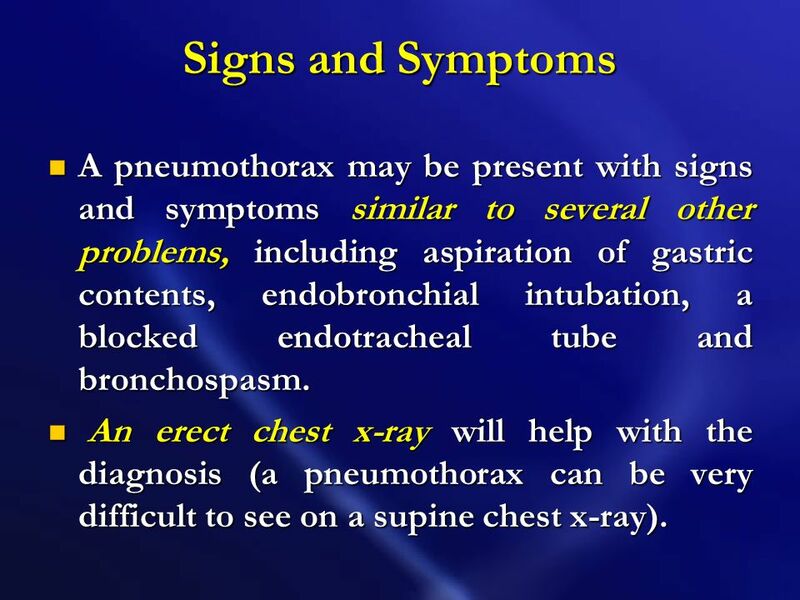 60 Signs and Symptoms A pneumothorax may be present with signs and symptoms similar to several other problems, including aspiration of gastric contents, endobronchial intubation, a blocked endotracheal tube and bronchospasm. 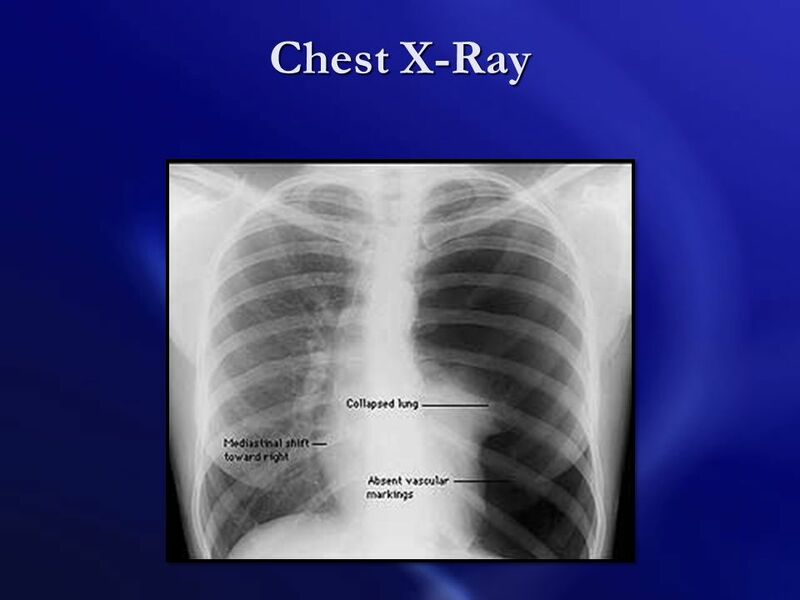 An erect chest x-ray will help with the diagnosis (a pneumothorax can be very difficult to see on a supine chest x-ray). 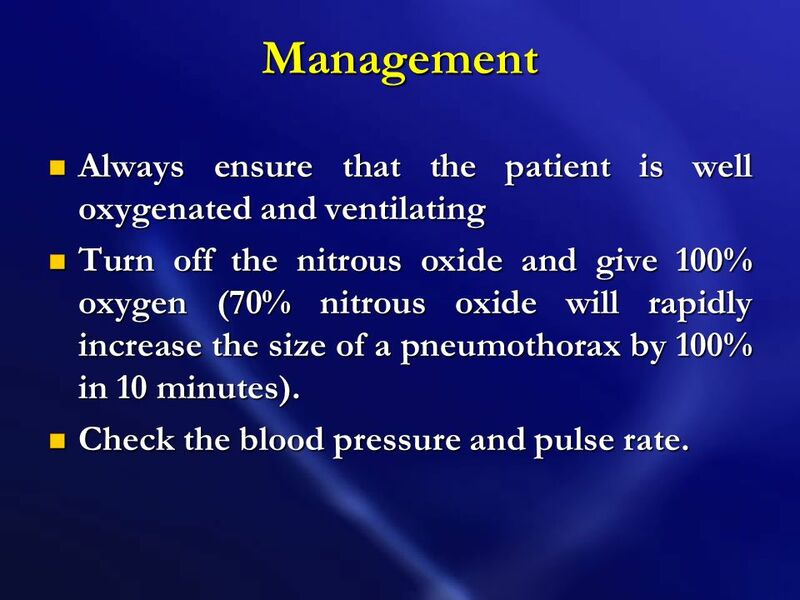 62 Management Always ensure that the patient is well oxygenated and ventilating Turn off the nitrous oxide and give 100% oxygen (70% nitrous oxide will rapidly increase the size of a pneumothorax by 100% in 10 minutes). Check the blood pressure and pulse rate. 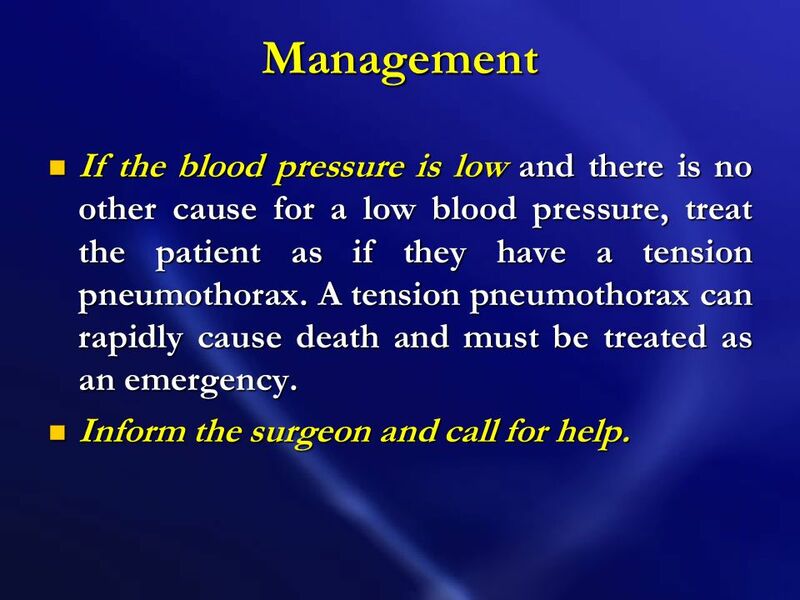 63 Management If the blood pressure is low and there is no other cause for a low blood pressure, treat the patient as if they have a tension pneumothorax. 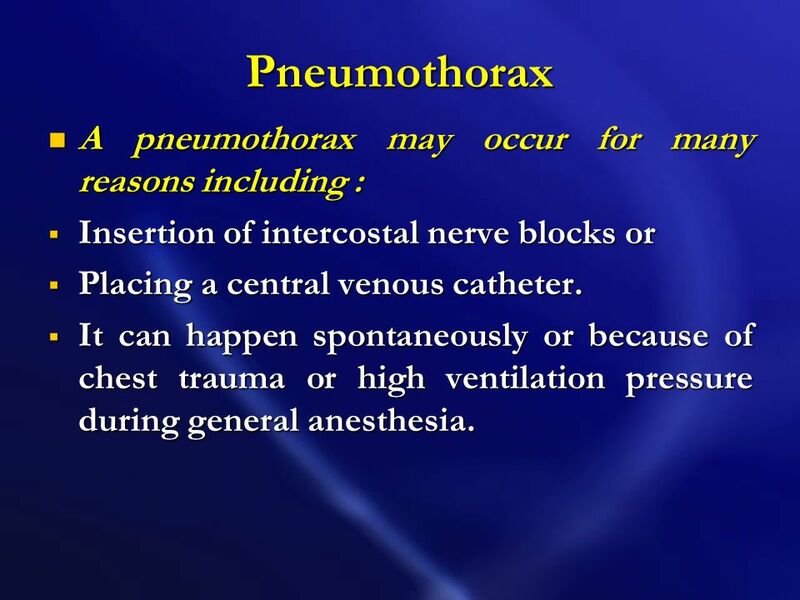 A tension pneumothorax can rapidly cause death and must be treated as an emergency. Inform the surgeon and call for help. 64 Management Insert a large intravenous catheter into the pleural space to aspirate the pneumothorax. 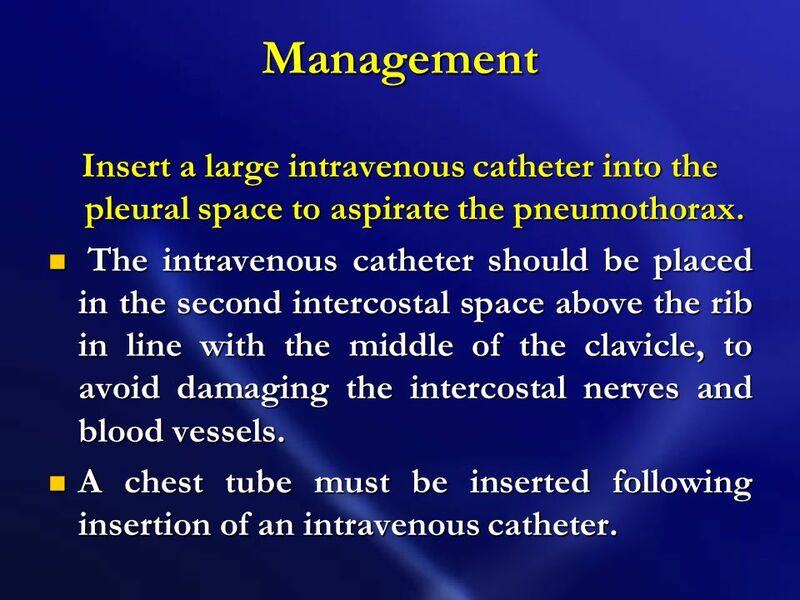 The intravenous catheter should be placed in the second intercostal space above the rib in line with the middle of the clavicle, to avoid damaging the intercostal nerves and blood vessels. A chest tube must be inserted following insertion of an intravenous catheter. 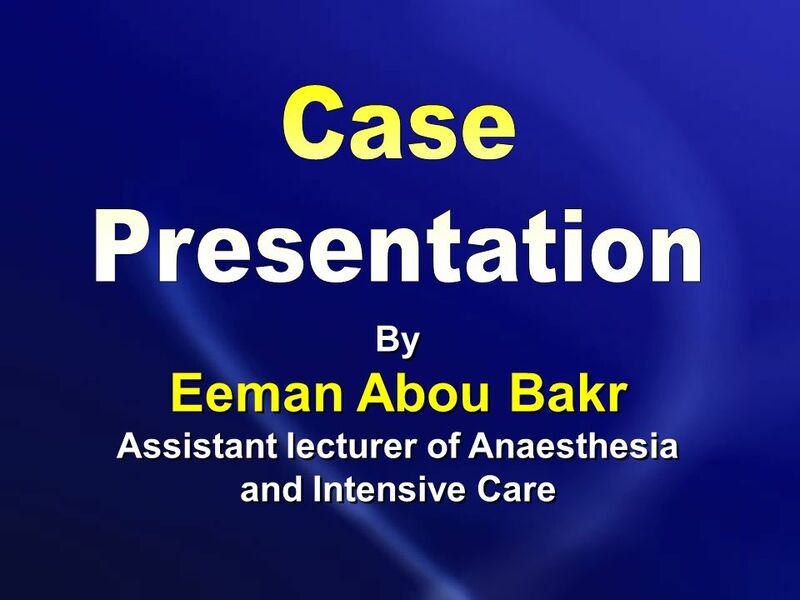 Download ppt "Assistant lecturer of Anaesthesia and Intensive Care"
RESPIRATORY EMERGENCIES. 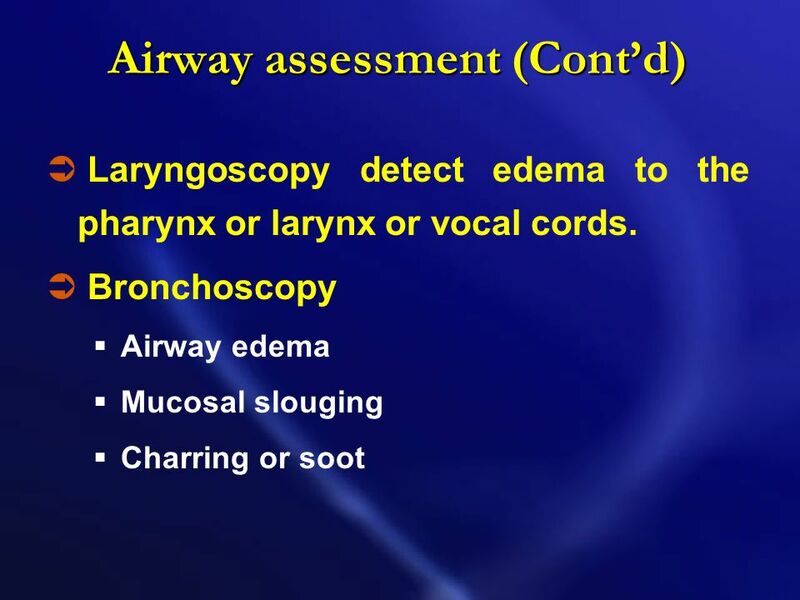 Nose/mouth – pharynx/oropharynx – Larynx – Trachea – Bronchi – Bronchioles – Lungs- Alveoli. 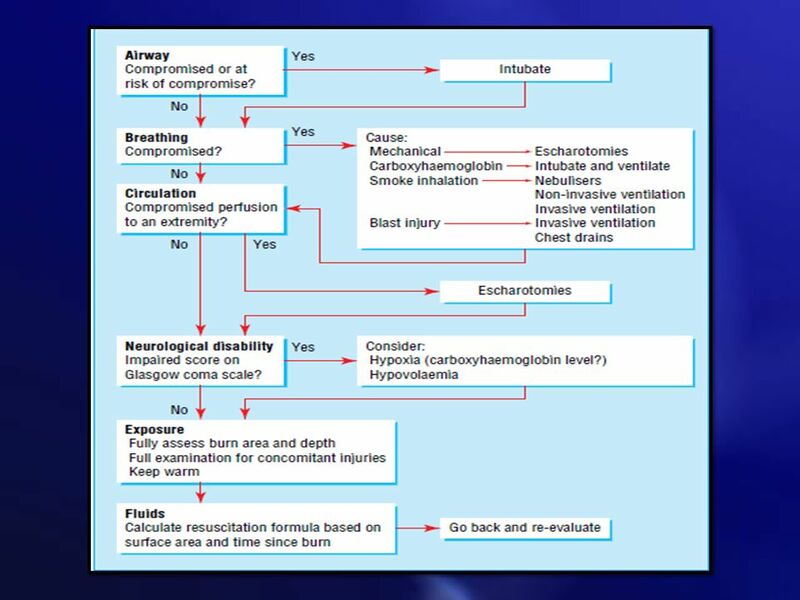 Inhalational Injury and Airway Management William J C van Niekerk Consultant Burns and Plastic Surgeon Queen Elizabeth Hospital Birmingham and Birmingham. Christopher P. Brandt M.D. Associate Professor of Surgery Case Western Reserve University BURNS Initial Evaluation & Management. 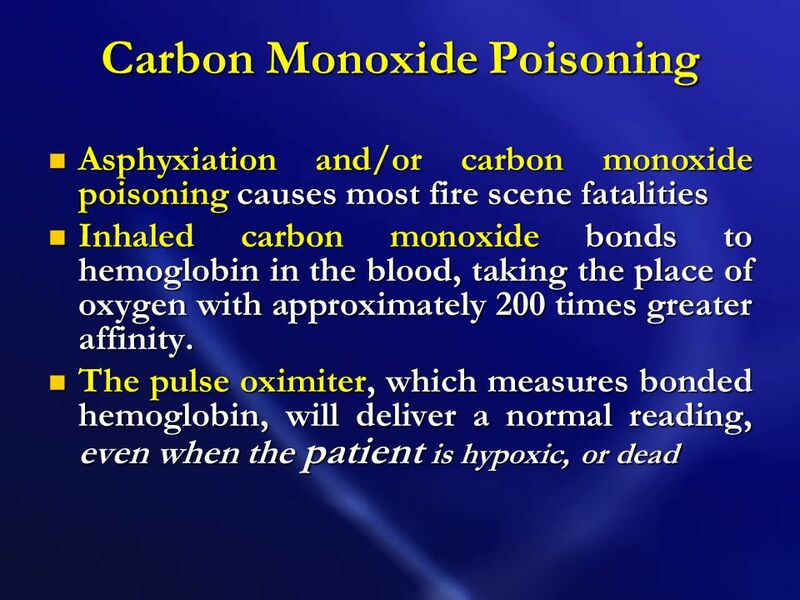 PULSE Classroom Carbon Monoxide: The Odorless Killer. 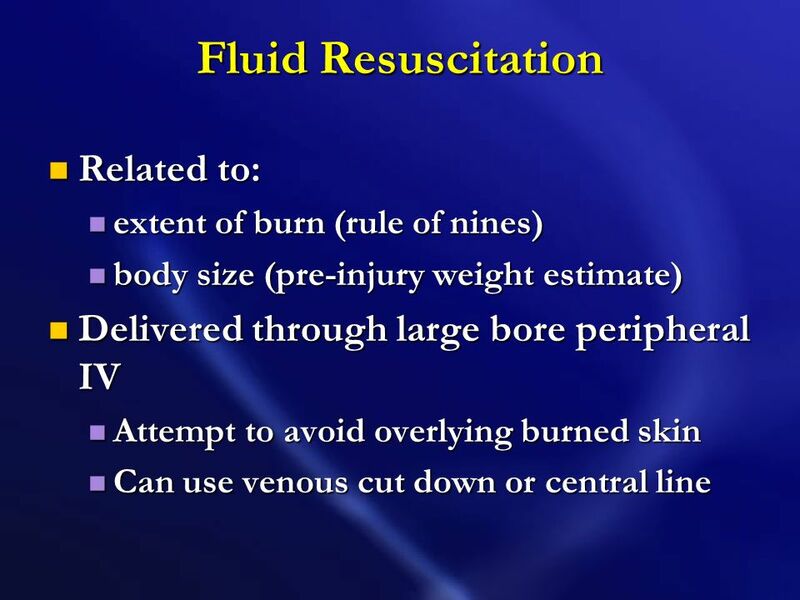 JAHD – 1/5/2012 PETER COTTRELL Estimation of ‘Burn % Total Body Surface Area (TBSA)’ and fluid resuscitation. Education and Training Module for Ohio EMS Developed in the 1960s Opioid antagonist Emergent overdose treatment in the hospital and prehospital settings. CPAP Respiratory therapy EMT-B. CPAP Overview  Applies continuous pressure to airways to improve oxygenation. 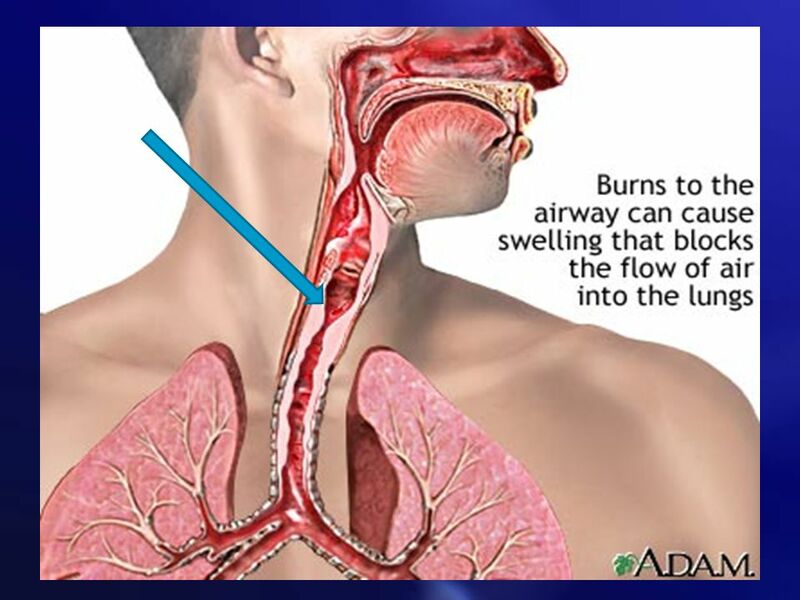  Bridge device to improve oxygenation. 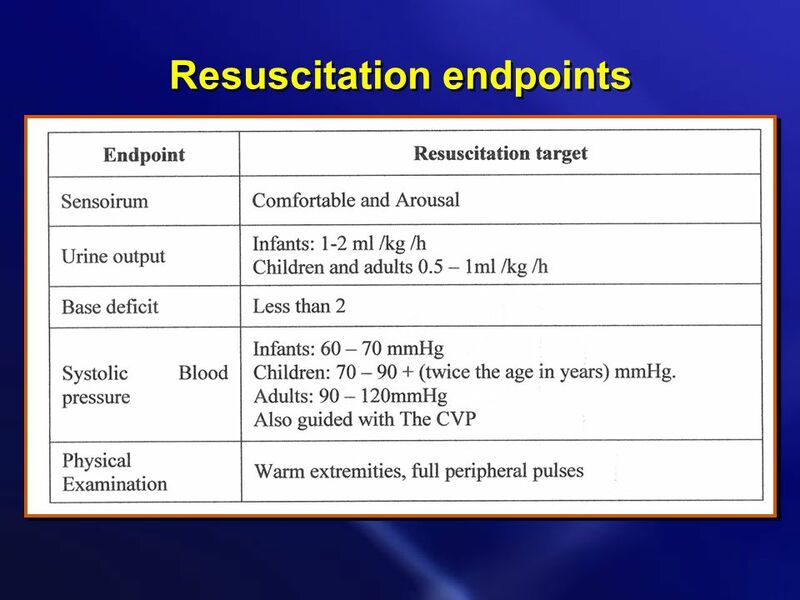 Recognition and management of the seriously ill child Dr Esyld Watson Consultant in Adult and Paediatric Emergency Medicine. Trauma, multiple casualties. Polytrauma Multisystem trauma Terminology: 4 Injury = the result of harmful event that arieses from the release of specific. 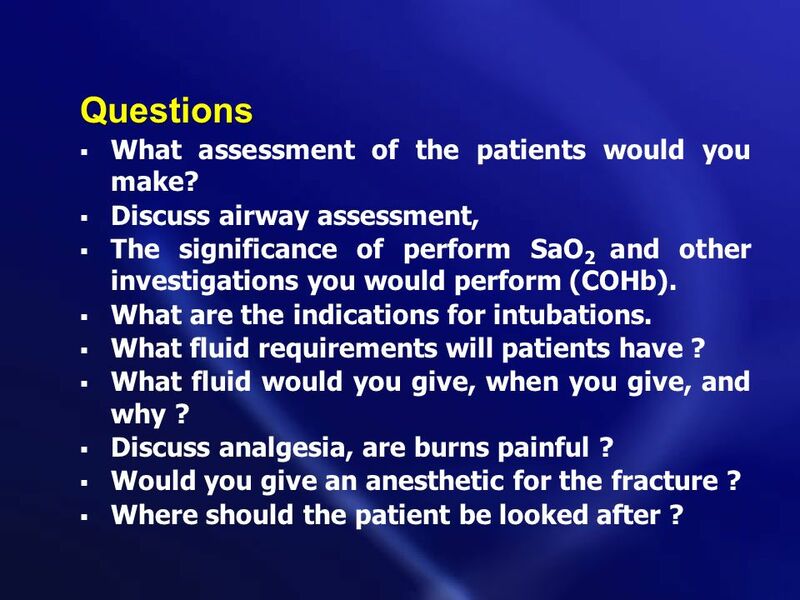 Anaesthesia for Trauma Patients By Dr. H. O. Opere Consultant Anaesthesiologist April 2013. BURNS BLS, ILS, ALS OTEP Russ Armstrong, EMT-I, Fire Prevention Officer, Stevens County Fire Protection District #1. 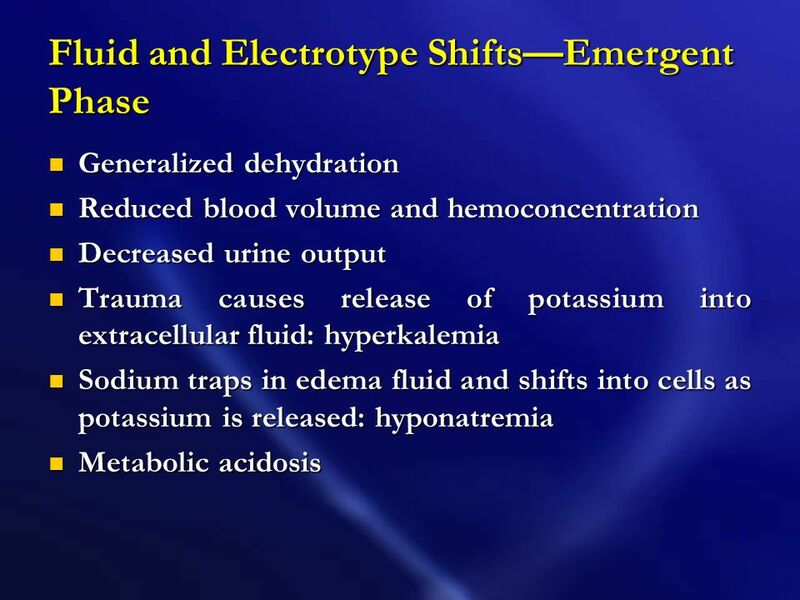 Heat Emergencies Prepared by: Steven Jones, NREMT-P.
Mosby items and derived items © 2007 by Mosby, Inc., an affiliate of Elsevier Inc. Chapter 12 General Anesthetics.